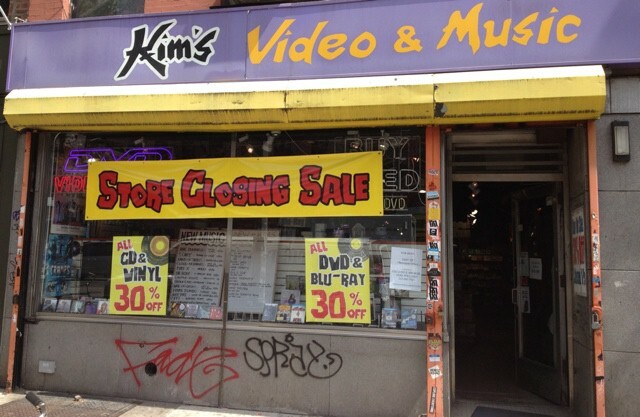 The Slits’ cover of “Heard It Through The Grapevine” (a B-side, obviously) played over the speakers at Kim’s Video & Music on 1st Avenue as a half-dozen early-afternoon browsers flipped through the vinyl. The ceiling, bifurcated into orange and purple halves shot through with yellow, hangs low, compressing the sound into a thick haze. “We don’t really carry a lot of metal?” Julianne, one of the two college-aged clerks, told a patron who asked if Kim’s carried the band Death’s earlier stuff. “That’s the only Death we have,” gesturing toward the new release sections. Julianne, who is graduating from NYU in a few weeks, has been working at Kim’s since the summer of 2012. “I spent all this time here and decided I might as well get paid,” she told me. But Kim’s is closing, and Julianne will have to find someplace else to slouch.
. Over the next fourteen years, “Mondo Kim’s” would come to take up most of the five-story building. At the height of its cultural influence and commercial success, Kim’s stretched across four locations, from Alphabet City to Columbia University. In the late nineties, more than 200,000 people were listed in the business’ database, and his employees were legendarily knowledgeable and haughty. “We went against every business model that says, ‘The customer is always right,’” Marello told the New York Times when the Avenue A store closed in 2004. “But I think in the end, people sort of liked the grungy East Village thing.” Two years later, in 2006, Kim’s Bleecker Street location became a Duane Reade; the Morningside Heights location closed in 2008; Mondo Kim’s closed shortly thereafter, donating its entire rental collection of some 55,000 DVDs and VHS tapes to the town of Salemi, Italy, and relocating to the smaller First Ave. store a few blocks away in 2009. Kim’s current manager, Kenny, has worked at the First Ave. location since it opened. He told me that the shop will be stocked with new releases until it closes two months from now. (When I visited, they were sold out of Sonic Youth, The Stooges, and Lou Reed vinyl.) Kim’s hasn’t stopped buying used material from patrons, either. I watched a customer haggle with Julianne over a used DVD; he wanted to get rid of it because it was scratched, but he wasn’t happy with the offered payment. “Would you keep it?” he asked me. I looked at the disc. It was probably the first time I’ve looked so closely at a CD/DVD in years; it looked more smudged than anything. “I would keep it,” I told him. “Same,” said Julianne. “Cry,” said one of the girls. You should open up your own shop, I suggested. Correction: The first sentence of this story originally stated that Kim’s was on Avenue A, not on 1st Avenue, because of a dumb editing error.